To: NY City Council joint hearing on Mayor’s Vision Zero report. Subject: In support of the Mayor’s Vision Zero report, particularly tools for data and engagement to empower local decision making capabilities. Good morning Transportation and Public Safety Committees. It is a great honor to address you and represent New York City’s technology community. Particularly, a rather active group of technologists – the civic hacker. I am Noel Hidalgo, the Executive Director and co-founded of BetaNYC. BetaNYC’s mission is to build a city powered by the people, for the people, for the 21st Century. Last fall, we published a “People’s Roadmap to a Digital New York City” where we outline New York City’s civic technology values and 30 policy ideas for a progressive digital city. We are a member driven organization and members of the New York City Transparency Working Group. A coalition of good government groups that supported the City’s transformative Open Data Law. Every week, members of BetaNYC gather to explore the city’s open data and build useful tools to empower our neighbors to make better decisions. This past weekend, Manhattan Borough President Gale Brewer, Council member Ben Kallos, and Council member Mark Levine kicked off a 30 hour prototype-athon where we focused on tools for Community Boards and City Council Members. First, we overwhelming support the this Vision Zero report. Since 2009, we have been asking the NYPD to produce machine readable crash data. 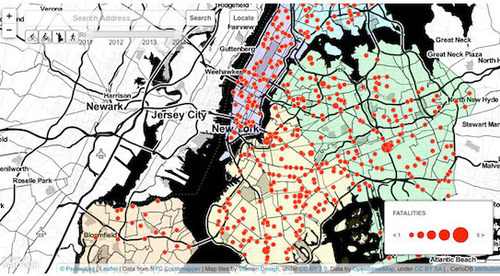 Since the 2012 and the passage of the City’s open data law, the NYPD has refused to do so. When we read “user friendly format(s),” we read that information and data must be produced in human and machine readable formats. To truly achieve Vision Zero, crash and moving summons data needs to be released. Within these datasets, data collection quality and data sharing frequency needs to be significantly increased to as near real time as possible. Finally, platforms for community feedback and ongoing dialogue around this information needs to be established. We continue to ask for the NYPD to stop massaging the data and preventing the public’s ability to track crashes. Currently, 1/5th of the crash data the NYPD produces can not be accurately verified. Additionally, due to a lack of transparency from the NYPD in its moving summons data, we are unable to know when, where, and why summons are written. The public has no clue where our traffic laws are enforced or if they are enforced where they are most needed. Attached, you will find 96 members of the New York City technology community who agree with this statement.